Villas and Apartments available in the Alicante area of Spain.Alicante is a large, vibrant city with something for everyone. It boasts long white sandy beaches, has a large Marina, many restaurants, pavement cafes, bars and nightclubs. 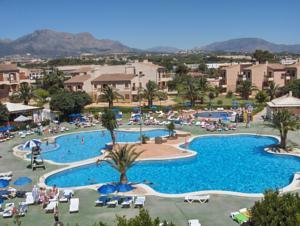 Click above for Discounted prices of Hotels on the Costa Blanca. Save up to 75% on your reservation!. 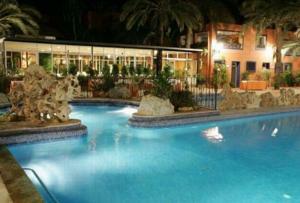 Click above for the 30 Hotels in the Alicante area. You can book online if you wish. Alicante is a large, vibrant city with something for everyone. It boasts long white sandy beaches, has a large Marina, many restaurants, pavement cafes, bars and nightclubs, a vast array of shops to suit all tastes and budgets, and places of historic interest such as El Castillo de Santa Barbara. The castle sits high on a hill offering spectacular views across the city. 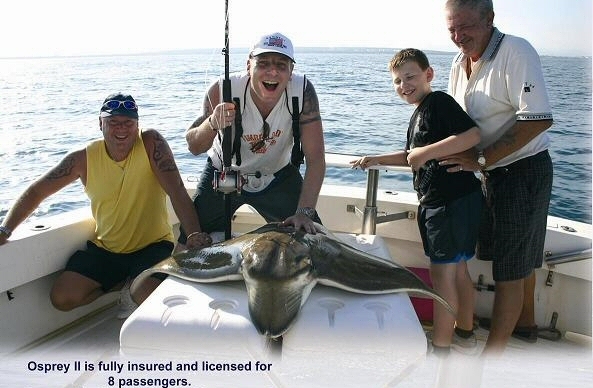 From Alicante Marina boat trips run all along the Costa Blanca. One popular trip is to the Isla de Tabarca, 17km off the coast. The Island boasts secluded beaches and is ideal for snorkelling. You can even take a trip in a yellow submarine! El Barrio in the centre of the city is the throbbing heart of Alicante's nightlife. You can party until the morning here in a vibrant Latin atmosphere. Alicante's largest fiesta is Festival de Sant Joan which runs for one week in late June of each year. Alicante becomes engulfed with street processions of floats bearing satirical figures made of wood and papier mache. The festival climaxes with a massive fireworks display over the Marina and the burning of all the floats. Please watch in HD.Alicante is the capital city of Costa Blanca (White Coast).This beautiful city enjoys excellent weather all year round, even during winter temperatures remain constantly at around 20 degrees centigrade so it's easy to see why the World Health Organization declared Alicante one of the healthiest places to live in the world. The Costa Blanca has over 100 kms of sandy beaches and rocky coves. -The northern Costa Blanca is typically mountainous with cliffs and coves, a mixture of pebble beaches and fine sandy beaches.It is surprisingly very green and lush. 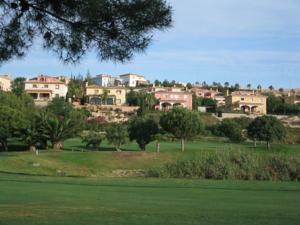 -The southern Costa Blanca is mostly flat with fine sandy beaches, palm trees ,palm groves,and salt lakes. The Costa Blanca has something for everyone from tiny rural inland villages to cosmopolitan tourist resorts on the coast . This beautiful city offers miles of coastline featuring turquoise seas and white sandy beaches centred around the main airport and medieval town of Alicante.The mountainous interior offers plentiful fascinating and intact medieval towns and fortified villages to explore .The extraordinary position of Alicante, flanked as it is by mountains and sea, endows the city with a beguiling beauty, and wherever you walk, the city permeates with the essence of the Mediterranean Sea.All the beaches in Alicante city & province have been awarded the European blue flag for quality of their crystalline waters, clean, & safe beaches. The Costa Blanca is one of Spain's most popular holiday regions and has become a popular second or main home for many Europeans who have fallen in love with its beauty.....Each town has something unique to offer,enjoy it! So why not explore some of these treasures during your stay ? There are many places you could tick on a "must-see" list. We would include among them Alicante itself (more than just an airport! 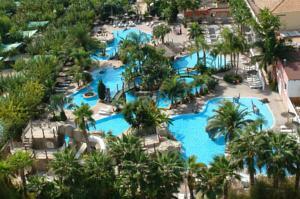 ), Torrevieja, Elche, Orihuela and - especially for the kids - Terra-Mitica. Around 2hrs drive north along the AP-7 is the city of Valencia, the 3rd largest in Spain, and well worth a visit. However, the real "must-see" of the area has to be (in our opinion), the tiny village of Guadalest, inland from Benidorm. Carved out of the mountain, access to the village is through one very small and narrow entrance, for easy defence in times of emergency; a fascinating and truly unique example of local Spanish heritage. Take the typical Spanish delight in savoring life and add to that perfect beaches on the Costa Blanca, a personable modern city, ideal weather, and wonderful Mediterranean cuisine. What do you get? The perfect place to study Spanish language and culture while enjoying the range of opportunities that Alicante presents. Alicante is a port city, known for being one of the jewels of the Costa Blanca with its white sandy beaches, palm-lined avenues, and mild climate. Students there will find a variety of water sports available when they're not studying. Alicante also offers ferry service to the Balearic Islands including Majorca, Minorca, Ibiza, and Formentera. However, Alicante is more than beaches and islands. It is a historic city with a variety of museums, a fascinating old quarter, and a variety of historic churches, cathedrals, and harbor area. Founded by the Greeks in 324 BC, the city has since been occupied by the Romans, Moors, and French, among others. The city therefore shows the influence of these many different cultures in its architecture and artwork. In the past decade, Alicante has invested itself in modernization that has paid off. Students there will find that they can immerse themselves in authentic Spanish culture while still having the nightlife, shopping, and business opportunities of a modern city. Alicante is actually one of the fastest-growing cities in Spain today with an economy based on industries such as tourism and wine production. A number of notable sites in Alicante include the Castle of Santa Barbara, Palmera Garden, San Juan Beach, and the Explanada and Port. The nearby island of Tabarca offers a natural marine reserve as well as the remains of ancient buildings. The Palmera Garden features a variety of palm trees and fountains and is a relaxing place for a walk. La Explanada is the largest park in the city and provides a perfect location to study. The Castle of Santa Barbara is located on a mountain called Benancantil and offers you the opportunity to explore its rooms, passages, and dungeons, as well as learning about Spanish sculpture. Alicante is famous for its cuisine, so make sure to check out the local restaurants and their unique Mediterranean dishes. Also, be sure to sample turron, a honey and almond nougat that is a food specialty of the city. If you are going to be in the city during the summer, don't miss the Bonfires of Saint John in June. The Bonfires coincide with the summer solstice, and although this festival is now celebrated in other cities in Spain, it began in Alicante and the city still offers the biggest, most bountiful bonfires. Alicante is located along Spain's Mediterranean coast in the country's Valencia region. The city's 310,000 residents therefore speak both Castillian Spanish and Valencian Catalan. Alicante is also known as Alacant in Valencian. 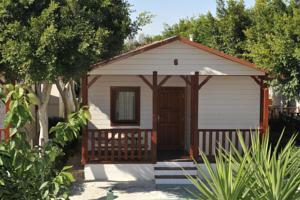 The city is ideally located for visiting many other exciting places in Spain. Approximately four hours from Madrid, Alicante makes the perfect jumping off point to explore many of Spain's famous cities such as Toledo, Barcelona, Granada, and Valencia.